Dress hook with thread and tie in a small clump of Rabbit fur. Any colour from black olives to brown.Tie in the body chenille and wind forward to 3/4 up the shank. Tie off on top of the hook as this piece will later be used as the wing case. 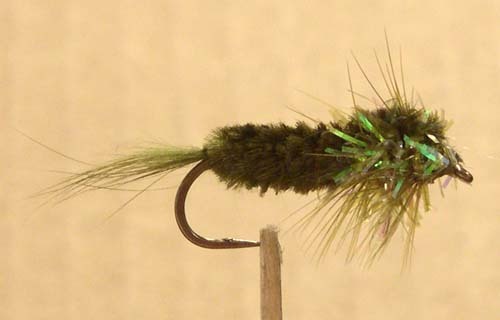 Tie in a hen hackle at this point (hackle must match gape of hook about 30% wider) Then tie in the cactus chenille wrap forward leaving room for the head and tie off. Wrap the hackle carefully through the thorax about 3 turns and tie off. Pull the body chenille forward over the thorax to form the wing case and tie off at the eye. Make a neat cotton head and cement making sure the eye does not become clogged with cement. Bret gave us a good tip for cleaning the eye of the hook, he pulls the left over piece of hackle through the eye. This cleans it up very nicely.